As I type this post, I can hear my husband's voice in my head saying, "It would be a lot greener to use what we have and not buy a bunch of new stuff." This is true, unless what you are currently using is unsafe. Several months ago we stopped using our badly scratched teflon skillets. According to the Environment Working Group, non-sticks pans can contain PFCs, many of which breakdown into PFOA (also known as C8) in the environment and your body. Once in the body, PFOAs can circulate for years. PFOA is considered a carcinogen causing testicular, pancreatic, mammary, and liver tumors in rats. Evidence has shown that scratched teflon when heated has the potential to kill birds because of the chemicals released. Plus if the pan is scratched, you will inevitably ingest some of those teflon bits. I know it seems like EVERYTHING causes cancer. My rational is why risk it? So I purchased a 12 " stainless steel skillet. You do have to use lots of oil and food still ends up sticking sometimes. I do not regret buying the skillet, but a non-stick skillet is really nice. On my search to find a low flow showerhead, I stopped by Bed Bath & Beyond. When I walked through the door, the first thing I saw was a big display of Green Gourmet cookware. I had read about the new cookware somewhere and evidently you can only find it at Bed Bath & Beyond. After browsing the display for awhile, I continued my search for a new showerhead. They do not have a very good selection of showerheads so I gravitated back to the Green Gourmet display. I did have a 20% off coupon. Hmmm. Then I thought this would make a great Mother's Day gift to myself. We can justify just about anything, huh? 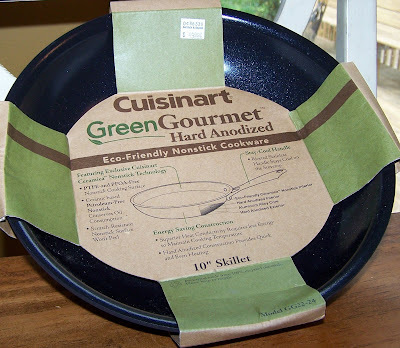 I bought the Green Gourmet 10" skillet, since I already had the 12" stainless steel one. I really wanted to get the grill pan, but decided that I would try the skillet first to make sure I liked it. Here are the specs on the skillet. If you want to read them from the packaging, just click on the picture above. The skillet is scratch resistant, the ceramic based coating makes it non-stick. It is petroleum free, PTFE (teflon) free, and PFOA-free. I have not cooked with it extensively, but the few times I have I really liked it. The skillet is very heavy and the surface is very slick. There was no sticking. The verdict is in....I love my new Green Gourmet skillet. Now I just need to find an excuse to get the grill pan and maybe one more small skillet. I have wanted this cookware for a while and seeing it on your post only makes me want it more. I told my husband last night because I'm ready to throw out the old pots and pans I'm using now (no reusing here). Also, enjoy cooking your vegetarian meals (I do the same) in your new pan; the simple pleasures in life. Keep snapping those pictures. They're great and a perfect way to preserve memories. I'm a "picture takin' fool" too! We're a vegetarian family and my husband does all the cooking. For several years he has been slowly poisoning us with the old scratched up teflon woks in which he cooks everything. A couple of years ago I bought a stainless steel wok as a replacement, but he hated it and went back to the teflon and they have gotten worse and worse. Today I am finally putting them in the trash and getting one of the "green" pans. I saw them at BBB today and was tempted to get one but didn't have a coupon on me. Next coupon I get in the mail and I'm getting one. By the way, Amazon also carries them. I also got these pans at BB&B. I have had them over a year now and use them daily and they're still great. I have to of the small (8 inch?) pans and the grill pan. I just called Cuisinart. After 13 months using my 10" Green Gourmet SS skillet, food sticks in spots making cooking quite a chore. Cuisinart said that I could send the pan to them and they will evaluate whether or not I'd get it replaced. This will cost me $14 to do so ($7 for me to ship to them and $7 for them to ship back) AND I may just get my "sticky" supposedly non-stick pan back. I think I want to put the $14 into the bank for my next skillet which WON'T be Green Gourmet. You should check out chefscatalog.com for a great deal on the whole set of green gourmet by cuisinart!